The story of Afghanistan is a story of juxtaposition  a long history of colliding landmasses and colliding cultures that continues unabated. Afghanistan has become familiar in the past few months. Those of us watching and reading the news have seen digitally rendered relief maps showing the fan of contorted mountain ranges radiating outward from the Hindu Kush near Kabul and the associated linear valleys extending westward toward Hari Rud and southwest toward Kandahar. All these places have names now familiar since the U.S. military became actively engaged in Afghanistan. The names of the many ethnic groups in different parts of Afghanistan have also become familiar. The Pashtun have long lived in the region near Kandahar and adjoining areas in Pakistan. The Hazaras, who live in the central mountains, partially trace their lineage to the Mongol invasion led by Genghis Khan in 1219. They were converted to Islam by Persian-speaking groups such as the Tajiks, who still live in northern and western Afghanistan. The geology of Afghanistan is also a collection: this of landmasses that began in the Mesozoic and continues to this day. Prior to the Mesozoic, the major landmasses that make up todays continents collected together into the supercontinent Pangaea. This one landmass contained the large equatorial Tethys Sea, where reefs of mollusks flourished and are now preserved in a large area of northern Afghanistan. Early in the Mesozoic, Pangaea began to break apart into two major pieces: Laurasia to the north of the Tethys Sea and Gondwana to the south. Smaller landmasses split off from Gondwana into the Tethys Sea. During the Cretaceous, one of these landmasses, now part of central Afghanistan south of the Hari Rud fault, was sutured against Laurasia. India was another one of these landmasses, migrating during the Cretaceous and Paleocene across the Tethys; by the middle Eocene, it had begun to collide with Laurasia northeast of Afghanistan, forming the beginning of the Himalayan orogeny. A tongue of the Tethys Sea remained between Afghanistan and India until the Pliocene. Deposited upon this remnant of oceanic crust was marine sediments. As this oceanic crust was subducted westward beneath Afghanistan, igneous activity increased along the eastern margin of Afghanistan that is now west of the Chaman fault. This sea also contained another small landmass that now surrounds Kabul; it collided with Laurasia and then India collided with it. Today, the Kabul landmass is encircled by suture zones. The marine sediments of the Katawaz basin folded as the ocean crust disappeared in the Pliocene. Afghanistan is a complex juxtaposition of geologic units: Colliding landmasses formed crustal sutures at their boundaries that have rejuvenated and multiplied into abundant lateral and thrust faults that in turn are compensating for continued crustal displacement. Geologic maps of Afghanistan illustrate this composition with many slivers of very different lithologies and ages bounded by faults. Understanding the complex geology, along with other earth science information, is fundamental for both military activities and nation building. While the regional geologic framework for Afghanistan has been published in recent journal articles, much of this recent work is interpretative and based on field studies done more than two decades ago. Nearly continual conflict, including the Russian invasion, has prevented more recent geologic field studies. The majority of detailed geologic information dates from the late 1960s and includes contributions by Afghan, German, Russian and French geologists, much of it in their native languages. People need this information to determine natural water supply, suitability of a land surface for transport, or delineation of unconsolidated fine sediment that may contribute to dust storms, called Bad-i-sad-o-bist-roz. Compiling it for these diverse interests is difficult. 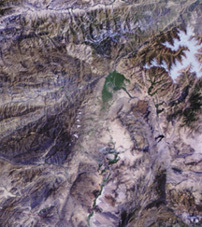 This portion of a Landsat mosaic shows the wide valley and surrounding mountains just north of Kabul. 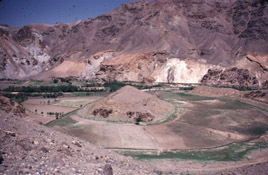 At the valleys northern margin is a vegetated alluvial deposit draining from the Panjshir river valley, which follows a northeast trending fault. Immediately to the northwest is a pale, elliptical granite pluton intruded into Paleozoic rocks. High, snow-capped mountains are on the eastern margin. A major military interest in Afghanistan is locating caves that may hide and shelter terrorists. Geologic maps could delineate carbonate lithologies expected to contain karst with natural cave formations; but the number of citations in the literature for significantly large natural caves in Afghanistan is low. Is this inventory low because of tectonic instability, a persistently dry climate, or a lack of exploration? Manmade caves are apparently abundant in Afghanistan; many are ancient. Caves were dug for habitation, for religious shrines, mineral extraction and as irrigation tunnels known as karez. Because of the lack of detailed geologic maps of Afghanistan, identifying the lithology at a specific tunnel can be difficult. This problem also holds true for many other regions around the world. Fortunately, remote satellite imagery, particularly hyperspectral imagery, can reveal valuable clues to a specific lithology in an arid region. The tunnels at Tora Bora, which have become well known in recent months, are in a category all their own. The area surrounding Tora Bora is known as the Kohe Sofaid, or also as the Spinghar mountain range. The dominant lithology is metamorphic gneiss and schist. The tunnels were initially developed during the Russian invasion by the Afghan mujahedin and apparently expanded in recent years by Al Qaeda. With his engineering background and financing, Osama bin Laden used hard-rock mining techniques to expand and enhance the large tunnels. Many smaller tunnels in the area were also developed using less sophisticated techniques and appear to be preferentially dug in softer rocks, such as schist, and others that are highly fractured. Complete destruction of the larger tunnels will be difficult if they are located in gneiss or other crystalline rocks. Collapsing the entrance may be the most that can be accomplished in these more massive rocks. However, a tunnel in softer rock, such as a clastic sediment, may be more easily destroyed. A lasting resolution to the conflicts that have plagued and continue to rattle Afghanistan is nation building. A significant foundation for nation building is identifying natural resources that enhance the livelihood of a countrys people and provide stability. Unfortunately, the most profitable agricultural product in Afghanistan has been the opium poppy. In this semiarid country, similar to Denver in climate, pockets of fertile land in the valleys of mountainous regions rely on irrigation via aqueducts from mountain snowmelt. These isolated valleys have proven ideal for poppy cultivation. The Taliban successfully outlawed the cultivation of poppies for a short period, apparently in an attempt to gain favor internationally. Given the economys reliance on the crop, though, this policy may have ultimately weakened the Talibans seven-year rule. Afghanistans other natural resources may not be as profitable as the cultivation of poppies, but they are diverse and some are abundant. The countrys geologic mineral resources range from exotic minerals such as lapis lazuli and other fine gems, for which Afghanistan has been an important source for many centuries, to more standard ore deposits such as gold, copper and iron. The Hajigak iron ore deposit west of Kabul has identified resources of 60 million tons, about half the yearly production of iron in the United States. Copper occurs in ore similar to the Zambian Copper Belt. Identified resources are estimated to be 240 million tons, making it a world-class deposit. Energy resources are apparently limited compared to those of neighboring countries Iran and Turkmenistan. Yet they are domestically important. Some areas may warrant exploring with modern technology, considering the countrys long hiatus in exploration and the abundant structural pockets of reservoir rock. Coal reserves in the Jurassic of northern Afghanistan, it is estimated, has identified resources of 90 million tons, comparable to just over half the yearly production in West Virginia. Identified resources of natural gas, also in northern Afghanistan, total 60 billion cubic feet, about 10 percent of the United States annual production. Speculation on undiscovered gas resources exceeds 3,000 billion cubic feet. Aside from energy resources native to Afghanistan, transportation of energy across national borders is another potential resource by virtue of Afghanistans strategic geography. Plans for pipelines to carry natural gas and oil from other landlocked countries in Central Asia, particularly Turkmenistan and Kazakhstan, have been hampered by various conflicts around the Caspian Sea. View to the north of the abandoned meander core of the Ghorband River that flows east along the right lateral Hari Rud strike-slip fault in central Afghanistan. The fault cuts directly through and facilitates the meander-neck cutoff. The Hari Rud fault extends from near the Afghanistan-Iran border on the west to the Wakhan corridor in the extreme northeast. One route through Afghanistan was pursued in the 1990s by the Argentine Bridas Corporation and then, in competition, by U.S.-based Unocal. These negotiations and tentative agreements involved various interests in Afghanistan, including the Taliban, Turkmenistan, Pakistan, the United States and even Russia. Unocal sponsored trips of Taliban officials to the United States and contributed considerable money through the Center for Afghanistan Studies at the University of Nebraska-Omaha to train people in Afghanistan on pipeline construction. These arrangements were made during a period when the United States government considered the Taliban a stabilizing power in an otherwise chaotic country. Ahmed Rashid referred to them as the New Great Game, an allusion to the political and military competition of historic proportion between the empires of Great Britain and Russia in the 19th and early 20th centuries. Instability and the onerous policies of the Taliban derailed these recent efforts. Once military activities cease, it will be time to implement constructive nation building. That means making wise and fair use of Afghanistans resources so that the people of Afghanistan benefit. Sandstone bluffs surround a chain of lakes in the Hazarajat region of central Afghanistan. The eight tufa dams and lakes of Band-i-Amir are 10,000 feet high. Tufa precipitation initiates when cold carbonate-saturated water flows from the surrounding marine-shelf carbonates and when the surrounding Cretaceous clastics receive slight solar warming. The escape of carbon dioxide from water falling over dams, and precipitation by algae and cyanophytes, also contribute to the carbonate precipitation.